I joined the Labour Party in 1963. I was eighteen-years-old and did not have a very good understanding of politics. Politics and West Ham United were the main subjects discussed in the lunch-time break in the Barking factory where I worked. Football was no problem but I struggled when it came to political issues. The man who seemed to know most about politics, told me I would get a good political education if I joined the local branch of the Young Socialists. I did nothing about this until I got a new girlfriend. Her mother, who was a member of the party, made the same suggestion. We lived on the Harold Hill council estate and they used to meet every Wednesday at the local community centre. The discussions we had on a Wednesday night were very different from those in the factory. Whereas most of the factory workers were mainstream Labour, these young people were revolutionary socialists and most were supporters of someone I had never heard of before, Leon Trotsky. They also liked Lenin but strongly disapproved of Joseph Stalin, who they claimed had betrayed the heroes of the Russian Revolution. They were not very keen on the current leaders of the Soviet Union but they much preferred them to those in the United States. The main political issue in 1963 was the Vietnam War and they used to get very worked up about the unwillingness of the new Labour leader, Harold Wilson, to condemn US foreign policy. Of course, I knew very little about the political ideas of Trotsky, Lenin or Stalin. I therefore joined the local library and began reading history books on these characters. Eventually I had enough information to have an opinion of these people. Although I agreed with their views on Stalin I was less convinced by those on Lenin and Trotsky. The person I did admire was Rosa Luxemburg. Trotsky also condemned decisions made by Stalin which he believed went against the views of most party members. However, he did not have a very good record when he had the power to make decisions. The Kronstadt sailors, who had played an important role in the Russian Revolution, became disillusioned with the Bolshevik government. They were angry about the lack of democracy and the policy of War Communism. Over the next few months we spent a lot of time discussing the merits of Leon Trotsky. Most of the members of the Young Socialists saw him as a tragic hero who retained his belief in communism. They also liked his views on the need for "world revolution" compared to Stalin's policy of "socialism in one country". That is why of course, the media has always been far more hostile to "Trotskyists" than "Stalinists". 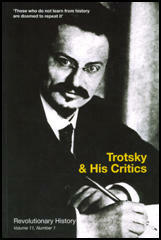 However, as far as I was concerned, Trotsky behaviour when in power, meant it very difficult for me to admire him. However, I did agree with the rest of the group about most issues. At constituency meetings we were in a small minority and always lost the vote at the end of debates. We accepted that is what happens in a democratic party. Our MP was Ron Ledger, who had represented Romford in the House of Commons since the 1955 General Election. The Young Socialists were not the only ones unimpressed with Ledger and just before the 1966 General Election, the local party attempted to deselect Ledger. Watson seems to be talking about me as I have rejoined the Labour Party recently. I was a member under Harold Wilson (who I believe is a much underestimated leader who has the impressive record of being the last prime minister who saw a reduction in the gap between rich and poor while in power). I also stayed in the party under the next Labour leaders, James Callaghan, Michael Foot, Neil Kinnock and John Smith, but left when Tony Blair made it clear it was no longer a socialist party. The problem for Trotsky was that Stalin was much more popular with the owners of newspapers and magazines in Britain than he was in 1936. They might have disliked communism in the Soviet Union but what they really hated was Trotsky's philosophy of world revolution. The media got is completely wrong at the time but it was not long after the war that historians were able to reveal the techniques used by Stalin to explain the ridiculous confessions made by Zinoviev and Kamenev. Ironically, they made their confessions as outlandish as possible in order to convince those in the rest of the world that they were lying. However, they clearly underestimated the gullibility of western journalists. Since the election of Jeremy Corbyn as leader of the Labour Party, it is John McTernan, who has led this campaign of smearing him as a Trotskyist. McTernan has an interesting history, he was Tony Blair's Director of Political Operations from 2005 to 2007. He was Chief of Staff to the 2014–2015 leader of the Scottish Labour Party, Jim Murphy, who resigned after the Labour Party lost all but one seat in Scotland in the 2015 general election. A month after Corbyn was elected leader, McTernan, suggested in The Daily Telegraph that MPs should organize a coup: "Minds are now turning urgently to what must be done. The answer is surely obvious – Labour needs competent leadership, and the current team have rapidly shown they are not up to it. How to engineer a change? A coup, obviously. But what are the precise mechanics?" Research carried out by Leon Festinger helps to explain why people like Watson and McTernan are unable to understand this development. In the autumn of 1954 Festinger came across an unusual story in his local newspaper. A 54 year-old housewife, Dorothy Martin, was claiming that the world would come to an end before dawn on 21st December 1954. She added that true believers would be saved from the apocalypse by a spaceship that would pick them up from the garden of Martin's small house in suburban Michigan, at midnight. Festinger, a student at the University of Minnesota, was fascinated by how Martin's followers would react after the prophecy had failed. Festinger contacted Martin and convinced her that he believed her claims that the world was going to come to an end. Festinger joined the cult and was in her house on 21st December. Martin's husband was not a believer and went to bed. The cult members kept checking outside to see if the spaceship had landed. After the deadline pasted the group became sullen and bemused. This was only a temporary feeling because it was not long before most of the people in the house became even more fervent believers in the Martin cult. In his book Festinger showed that this behaviour, while extreme, provides an insight into psychological mechanisms that are universal. Festinger used the term cognitive dissonance to describe the inner tension we feel when our beliefs are challenged by evidence. As Matthew Syed, the author of Black Box Thinking (2016) has pointed out: "In these circumstances we have two choices. The first is to accept that our original judgements may have been at fault. We question whether it was quite such a good idea to put our faith in a cult leader whose prophecies didn't even materialise... The second option is denial. We reframe the evidence. We filter it, we spin it, or ignore it altogether. That way, we can carry on under the comforting assumption that we were right all along." Tom Watson, John McTernan and those Labour MPs who are attempting to remove Jeremy Corbyn are suffering from the same problem that faced Ramsay MacDonald in 1931. He found it impossible to reject the conventional economic ideas that he had developed since he entered political life. So strong was this belief he was willing to propose a £70 million economy programme that included a £13 million cut in unemployment benefit. Tom Johnson, who wound up the debate for the Labour Party, declared that these policies were "not of a National Government but of a Wall Street Government". In the end the Government won by 309 votes to 249, but only 12 Labour M.P.s voted for the measures and MacDonald was expelled from the party. The National Executive Committee's response to the popularity of the Labour Party under Jeremy Corbyn (it is now the largest political party in Europe) is to expel members who they think might be his supporters. This includes banning all members who joined fewer than six months ago. While at the same time allowing people to pay £25 to vote in the leadership election. They seem to be convinced that most of Corbyn's supporters are too poor to pay the extra £25 to register.